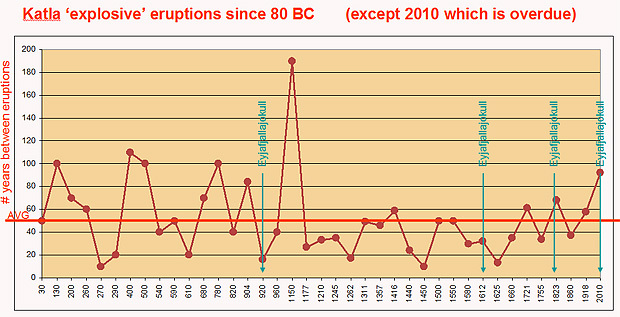 The average time between Katla eruptions since 80 BC is 52 years. The Icelandic volcano has pretty much followed this average time between eruptions except for a few instances, one of which extended 190 years leading to the eruption of 1150. However there is some controversy regarding an eruption in the year 1000 (which would have followed the ongoing average) in that the tephra / ash of that time was credited to a different volcano. 92 years have ticked by since Katla’s last explosive eruption, nearly twice the average 52 years between historical eruptions. We are overdue in 2010. Eyjafjallajokull, Katla’s nearest neighbor volcano has erupted four times, while each eruption has occurred immediately preceding a Katla eruption. As you can see in the time-line above, it seems more than just coincidence that these two volcanoes have erupted together during the past 2,000 years. Now that Eyjafjallajokull has erupted (14-Apr-2010), the clock is set and ticking for Katla (assuming history repeats itself). The Katla volcano, which hides beneath the Myrdalsjökull icecap, has the potential explosive power of perhaps up to ten times that of Eyjafjallajokull, and is currently awake with regular earthquakes popping underneath it. There are additional and more scientific ways to predict the eruption (monitoring tremors and frequencies, earthquake swarms, GPS movements, expansion – contraction, etc..) however in this example, I thought I would simply look at history, knowing that it truly does often repeat itself. So, why is any of this important? The Katla variety volcano is large enough to cause significant disruption in today’s modern society which depends on unobstructed air travel, and whose population lives on food that is grown on highly leveraged super-farms that in turn depend upon nature to provide adequate sunlight, weather, and temperatures to maintain their output. If Katla’s ash plume is large enough and explodes high enough, it could potentially cause great local damage while lowering global temperatures and blocking some percentage of sunlight from reaching the ground for a period of time. Are you prepared? The Clock is Ticking. And It’s so very foolish of the Human Race to have a WARNING Shot, & then go back to ignoring Icelands Geological dangers. This Volcano is due to explode. And according to my figures, it’s Due around about NOW, or if it doesn’t happen in may, it will be during the End of Summer – Sept/Aug/October 2011. If it doesn’t erupt this year, then we will be surprised in 2014. This Volcano doesn’t play games. It will dwarf last years sneeze, by over 10-fold. @KINDLE, I agree entirely. I have been following the Katla volcano daily for a year now and have posted quite a few articles regarding this and the Iceland time-bomb (especially for Europe). Katla has always erupted after Eyjafjallajokull, by 6 months to 1.5 years. If it goes it goes. Not really much that we can do to prepare for it. And here we in 2016 Katla upgraded to Yellow Status.